Used both as an ingredient and a main dish, eggs are a food product produced by poultry. Though there are many types of eggs available for food preparation (duck, goose, quail, turkey, ostrich), hen, or chicken eggs, are the most commonly eaten. The Hebrews, Egyptians, Greeks and other ancients regarded the egg as a symbol of the universe. The outer shell represented the sky and the inner skin, the air. The egg white represented water, and the yolk, the earth. Eggs were presented as offerings to their gods and used on occasions of ceremonial celebration. Standard eggs are commercially produced, commonly found in food stores and used more often than any other type. Most standard eggs have white shells, but sometimes eggs with brown shells are available. The shell color is determined by the breed of the hen and there are no differences in taste or nutritional value. Fertile eggs contain a small amount of male hormone, and though they were once thought to be more nutritious than standard eggs, they are not. Fertile eggs are more expensive due to higher production costs. They also spoil more quickly. Organic eggs are produced by hens that have been given feed made without fertilizers, pesticides or herbicides. They are equal in nutritional value to other eggs, but they are more expensive. Free-range eggs are produced by hens that have been raised with daily access to the outdoors instead of confined pens. Again, the nutrient content is the same, but the price is higher. Chicken eggs are typically classified and sold in four standard sizes: medium, large, extra large and jumbo. Unless otherwise specified, most recipes use large eggs. They are also categorized into grades AA, A and B according to USDA standards for quality. Always choose AA or A eggs—these have a well-formed yolk surrounded by a firm-textured white. Lower grade eggs will have thin whites that spread when cracked open. They will also not be as fresh. Be sure to open the carton at the store to check that none of the eggs are cracked. Slightly move each one with your finger to see that they aren't stuck to the bottom of the carton, which indicates they have leaked. Also check the "sell by" date. Eggs should always be refrigerated in the carton in which they came. This helps keep them from losing moisture and absorbing odors from other foods. 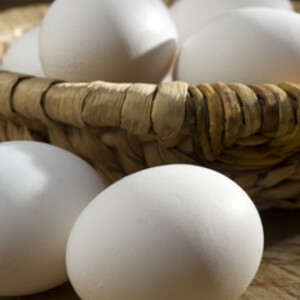 Storing eggs large-end-up will also help retain freshness, keeping the yolks centered.